One of my favorite singer-songwriters is Loreena McKennitt. She sets well-known poems to music and her beautiful, haunting voice and inspired orchestrations bring these sometimes timeworn words to vibrant life. 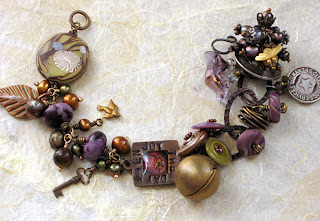 Her adaptation of Tennyson's poem “Lady of Shalott” was playing on Live Ireland a few weeks' ago as I was working on the Art Bead Scene's November challenge. The poem is very bittersweet and sad and the image in my mind was of the painting by J.W. Waterhouse, a Victorian artist. The painting chosen this month for the Challenge is also by a Victorian artist, though it's a world apart in execution, theme and emotional outlook. 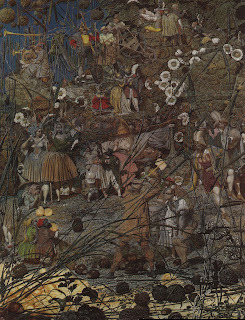 “Fairy Feller's Master Stroke” was painted by Richard Dadd, a patient at Bethleham Hospital--known popularly as Bedlam-for murdering and then dismembering his father. The director of the hospital made painting supplies available to Mr. Dadd, who had attended the prestigious London Academy of Art and had a respectable, if not stellar, reputation as a painter before he went off the rails. I found the painting very disturbing, to say the least, for a number of reasons. Nothing is alive or growing in the woods surrounding the figures-- it is the dead, brown landscape of autumn. 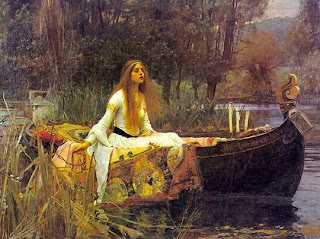 The Victorian loved their colors deep and rich and painters of the era were master colorists, layering tints in transparent washes over base tones to achieve startling effects of intensity and depth, even in a muted palette like that in Waterhouse's Lady of Shalott painting. The only noticeable colors used in Dadd's painting, at least in the larger reproductions I searched out on the Tate Museum's site were the primary colors of red, blue and green. The level of detail, which is what most people notice, is truly astounding; in fact, it is somewhat 3-dimensional. Apparently the Tate lights the painting from the side, so visitors can appreciate the dimensionality of its diminutive 15 X 20” size. While researching the painting, which I always do before I start interpreting them in jewelry, I found many analyses of the work, among them that Dadd claimed it was based on Shakespeare's Midsummer Night's Dream and portrayed a fairy kingdom. 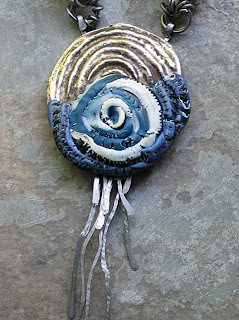 I found the characters scary and grotesque and decided to work in a different direction, recreating elements in polymer clay of the natural world that Dadd had painted so thoroughly and used so abundantly. 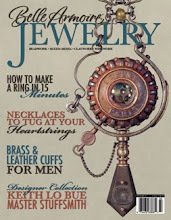 The Victorians loved complexity in every aspect of their surroundings-- jewelry, interior décor, clothing, architecture. I made an impression in molding putty of a section of an ornate Victorian picture frame and used it to make a practice piece which was antiqued and slightly gilded. 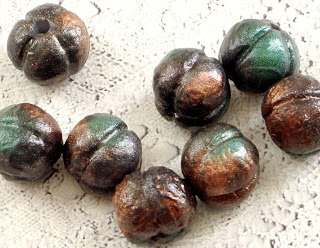 My goal was to create a piece of wearable jewelry--not mimic the painting-- so I made several large lentil beads in the same way as the sample, adding subtle gold highlights to elevate the somber tones of Dadd's very neutal palette with gilding. 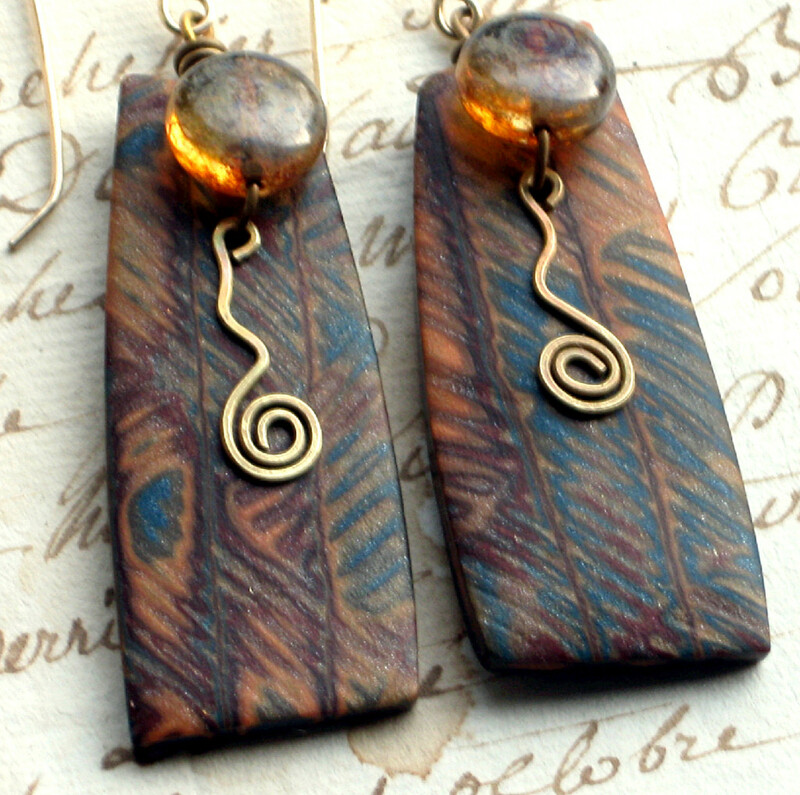 I brought in the muted primary colors using two tube beads covered in clay done in a mokume gane technique with midnight blue, ocher yellow and burgundy. 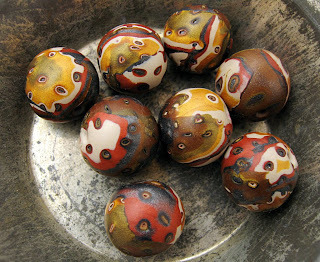 The pods and seeds allowed me to play with my raku technique and after I used metallic powders on them, they were glazed with a wash of Byzantia brand metallic paint and highlighted with colored pencils to bring out the primary colors. 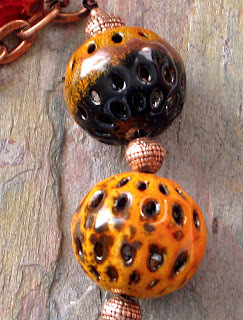 I looked through my stash for similar-sized beads to complement the raku elements and added some yellow faux jade beads, picture jasper rounds from my local Ben Franklin variety store, and gold-painted polymer clay melon beads that I detailed with gunmetal acrylic paint—all separated by African rough bronze spacers from Objects & Elements. A second layer of smaller elements was added to jazz up the neutrals and intensify that sense of over-the-top Victorian embellishment. I made a clasp using brass washers and some bronze wire for an s-clasp so I was able to layer the smaller strand over the larger one. This was overall a very intense and time-consuming process but I enjoyed doing it more than any piece I've done for the challenges so far. I call the style tribal Victorian and named it "Lady of Shalott". I finally posted a blog earlier this week after about a month's inactivity. I was active but the activity was more mental than physical and blogging about it wasn't all that interesting. Besides, blogging is such a visual medium, at least for artists, and I wanted to wait until I had something to show. I was in a thinking and reflecting mode-- taking a new class, visiting with my sister, discussing new directions, doing some new collaborations and trying some new techniques. Actually, my writer's block is more of a “maker's block”-- I have too many ideas and nothing seems to get created! Some of my readers may be rolling their eyes and thinking, “That's a problem?” Well, it is when you can't seem to settle down on one thing and complete it. Too many balls in the air! 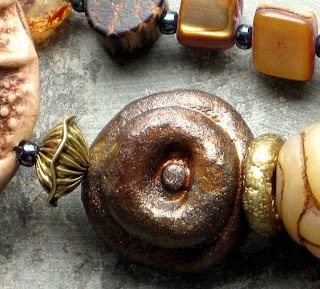 One thing I've been working on are beads for a few new collaborations with Cindy Wimmer of Sweetbead Studio. Cindy is so easy and fun to work with and I really respect her design ability and artistic flair. She makes my beads look good! We can't show you the results right now but hint-hint--they will show up in publications in the future. Here are the beads. Some conversations she and I had while working together resulted in my experimenting with a fun product called micaceous iron oxide, a type of paint known among polymer clay artists as “raku sauce”. 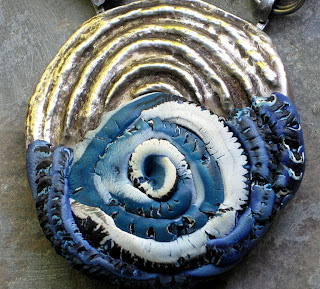 It gives a finish to a smooth surface that you would expect from traditional raku, a Japanese technique using a rough clay body that is fired quickly and develops some very interesting metallic glaze effects. So I set out to mimic some of those colors using quirky tube bead shapes, metallic paints and powders. 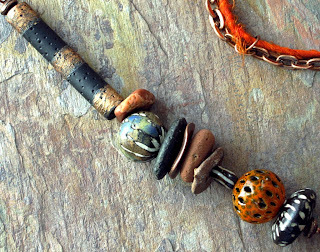 I liked the result so much that I included the tube beads in my Hallowe'en Tribal necklace (see post on Nov. 2) and one I put together this morning, drawing on one of Lorelei Eurto's pieces in Jane Dickerson's book Chain Style for inspiration. There are quite a few fresh and unusual takes on stringing and chain in this new book so I consider my purchase to be money well spent. I've always loved the Hallowe'en color palette-- pumpkin orange, sleek kittykat black, tumbling autumn leaves in rust, gold, and crimson, big ochre Harvest moon, scudding gunmetal gray clouds over pale stars-- it's rich and mysterious all at the same time. 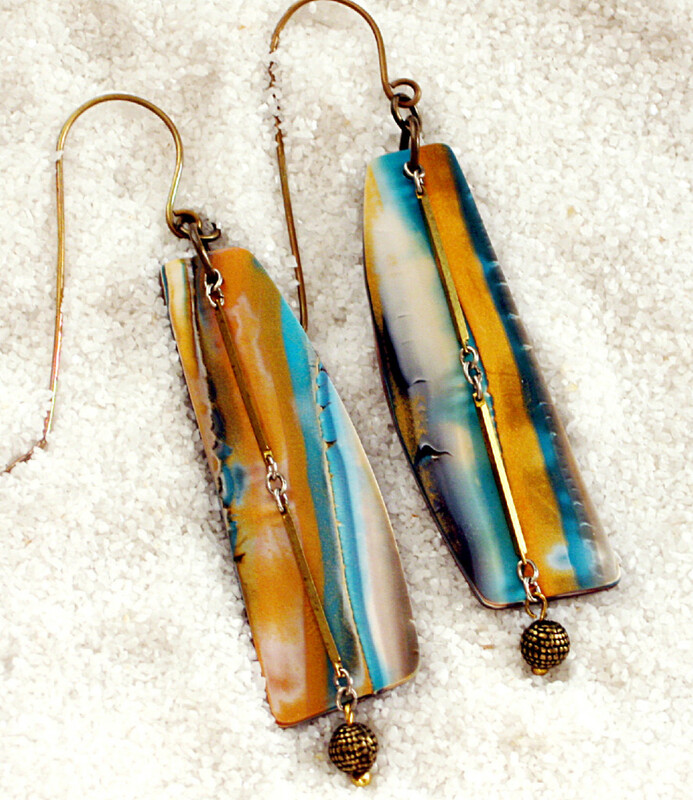 Since I've lately fallen deeply in love with beach stones and enameled beads, it seemed natural to me to use these two unique elements in a piece about the season. 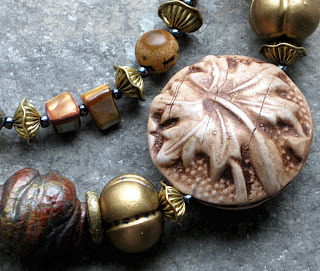 Barbara Lewis whipped out a custom order of her new Persian Lantern enameled beads for me and I found the perfect wave-tossed and tumbled beach stone Hallowe'en focal in the Etsy shop of Stone Me. Happiness is the perfect combination of orange, black and texture! 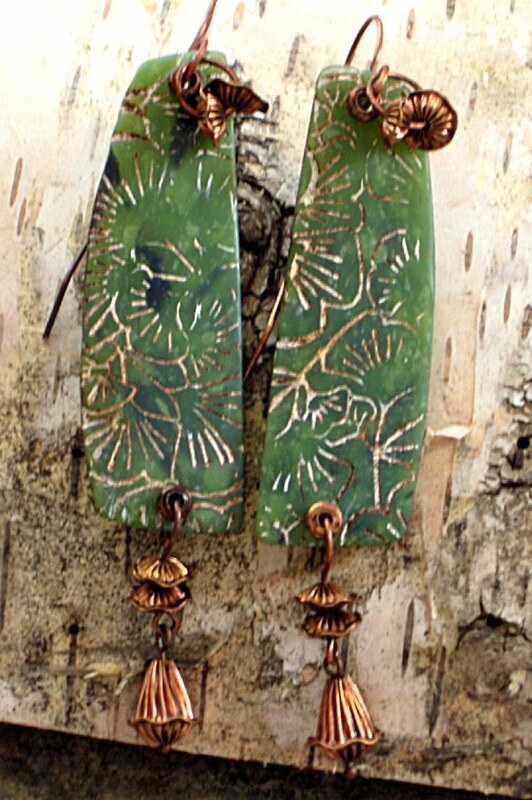 I paired the hammered copper washers from the auto parts store with the chunky wrapped links my friend Cindy Wimmer used in her bracelet featured on the cover of the latest special issue of Easy Wire. 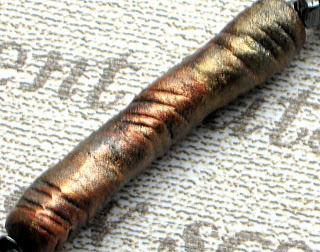 After making several tube beads out of black polymer clay, they were textured differently, cured and then were embellished with metallic powders and acrylic paints. 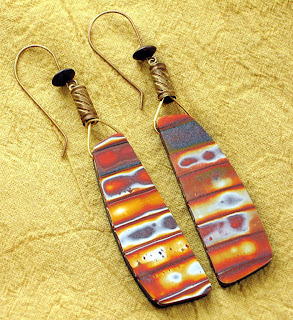 I was going for a raku look and decided the banded one had the right weight and look. 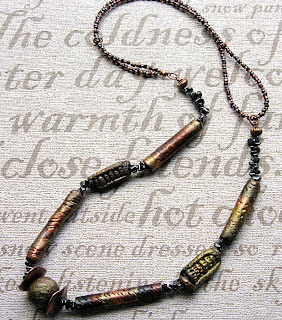 I just happened to have the copper seedbeads on hand and used them for little wirewrapped segments up one side of the necklace. The little swirly copper charm hanging from the focal is made with BronzClay, one of the pieces I did in Celie Fago's metal clay workshop last month. You'll be hearing about that more in upcoming posts and seeing more of the things I made there. So here's your finished Treat, Gentle Readers! I hope you didn't think I'd abandoned you-- just a short hiatus to reflect, renew and refresh my ideas. I hope to share some insights into new directions I'm exploring. I think they're exciting and I believe you will too! Stay tuned! My Little Bumblebeads are out in the world! 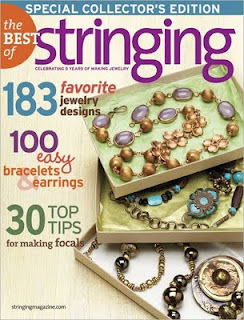 Interweave Press' “The Best of Stringing-- Special Collector's Edition: Celebrating 5 Years of Making Jewelry” is out on newsstands and one of the new projects that is included is The Rusty Convertible, designed by Lorelei Eurto and featuring my Little Bumblebeads! 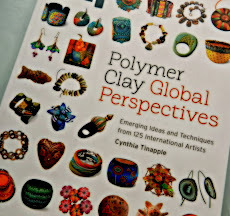 This is very exciting, to say the least, as I only started doing polymer clay seriously about this time last year. But this little tale of modest success is not about me but more about the generous folks in the beading and polymer clay communities. 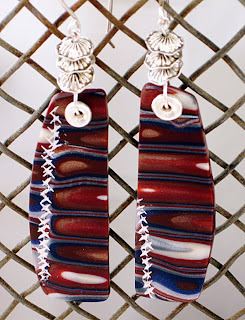 I am very lucky that I made connections with artists that appreciated my style and were generous about promoting my work on their blogs and in their designs-- thank you Deryn Mentock and Lorelei Eurto. When I asked these folks for advice, they gave it-- thank you Heather Powers, Jennifer Stumpf and Deryn. 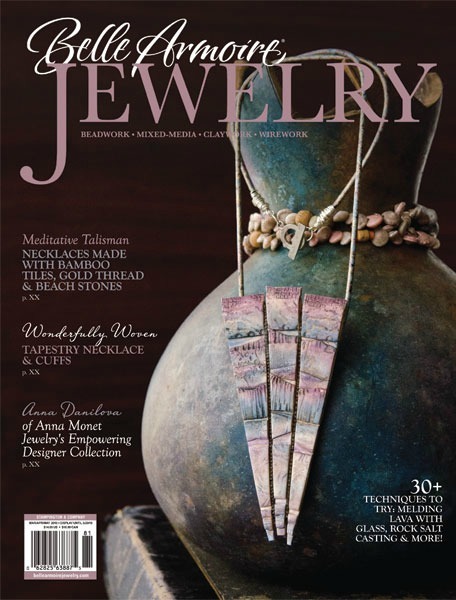 These designers invited me to collaborate with them, they let me put their work on my blog-- thank you Heather, Lorelei, Erin Prais-Hintz, Erin Siegel , Cindy Wimmer and Sharon Borsavage. 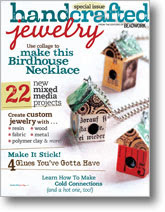 Thank you, Art Bead Scene for the wonderful challenges you promote every month and to Cynthia Tinapple at Polymer Clay Daily for your posts about Stories They Tell. 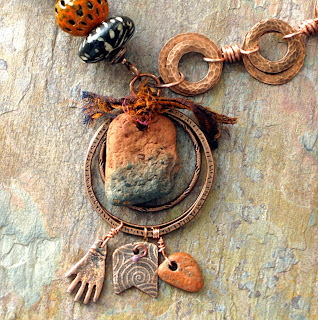 Special thanks to my Vermont clay buddy, Cindy Walcott, for all her advice, creative critique and support! 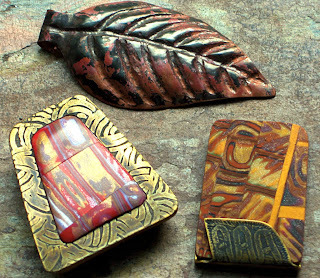 And to Barbara Lewis, another potter and super-creative woman who I wish was my neighbor so we could do enameling together! Not at all least, thanks to my Etsy customers, for helping me to keep those supplies coming in so I can keep doing what I love! And big warm thanks to all of you readers who leave such supportive and perceptive comments on this blog! They make me believe that what I do has some positive impact in the world and that is the most important success I can have. I am grateful and humbled by the friendship of all of you. As many of you may know, depending on the day and the project, a business partnership with a husband can be wonderful or horrible. Sometimes both on the same day! It's the joy of camaraderie-- or a lot of deep sighs and muttering under your breath. Mars vs. Venus, big time! My husband, Douglas, takes many of my Etsy photos and has collaborated with me on numerous jewelry projects -- doing metal work and etching--and as long as I tell him what I want but not how to do it, we get along just fine. He doesn't care about the big picture – and, in truth, usually I can't tell him what the final product is going to look like-- I don't know myself! That's just how I roll. 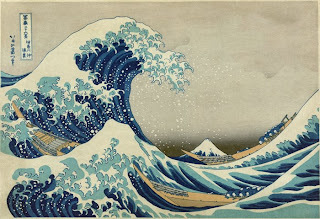 The August Art Bead Scene challenge-- an ongoing monthly call to interpret an artwork using art beads and stringing-- was Hokusai's “The Great Wave ”, a woodcut print I've always loved. If you've ever been in a small boat at sea during stormy weather, you can appreciate how the artist has captured the feeling of the icy, angry sea washing over the deck as you struggle to keep from going under. The picture really captures the majestic yet unpredictable power of Nature. 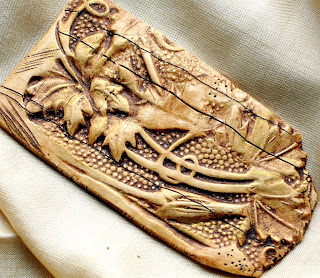 As I pondered what to make for the August piece, I remembered that Douglas had been bugging me to give him a project so I had him do a repousse base for the clay I planned to use as a pendant. We are still working in nickel, as the price of silver continues to escalate, but this metal sheet actually had just the right kind of dark shine that was needed in the design. 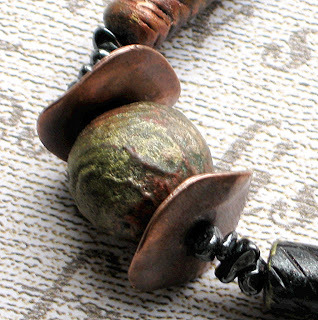 After lots of hammering and bending of the edge around a wire to smooth it, Douglas' pendant was ready for its clay embellishment. 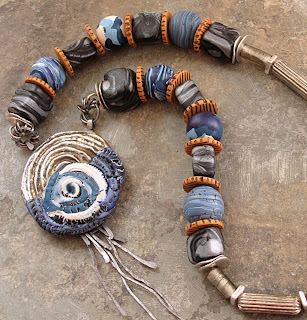 I mixed up the clay for the various blues to extrude for the pendant and to make the accompanying beads. I did several versions-- a swirly wave one, one I call the “Cloud Bead” and a simple marbling of all the blue tones together. I noticed that the background of the print is a subtle gradation of charcoal gray to pale gray so I did some metallic marbling for those beads and made them into organic square shapes. After arranging them all on my bench, I realized I needed something to offset all the blue/black/gray/silver tones. 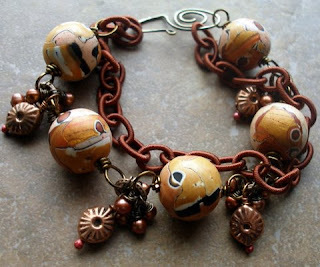 I just got my copy of Lindly Haunani and Maggie Maggio's book, Polymer Clay Color Inspirations, I've only dipped a toe into so far, but I had been thinking of bamboo beads so I mixed up some sandy orange clay and scored and antiqued some spacer beads to break up the round shapes and add some complementary color to the mix. 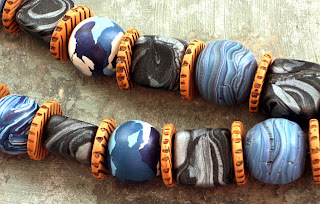 I finally posted the finished work on the Art Bead Scene Flickr site-- yes, I know it's September but I really want to keep completing these challenges once I start them! I'm compiling a nice body of work in the process and every month's assignment really stimulates me to push the envelope of what's possible-- a potent exercise both for the brain and for the creative Muse. The other enjoyable thing is seeing the diversity of what everybody else has done using the same artwork as a starting point. And sharing what we've all made with the same intention in mind is truly the best kind of working together. A guitarist friend of mine once told me that a musician's fantasy was a band composed of clones of themselves, with each one playing a different instrument. That way, you would have total artistic control over tempo, phrasing, improvisations, etc. I could see his point, in a way-- I was in a few bands and if you could find a bass player with rhythm, then the banjo player couldn't keep up with the fiddler, or the backup singer couldn't sing harmony. Synchronicity-- similar ideas happening independently of cause and effect-- seems to happen only when the right combination of personalities and talents come together. 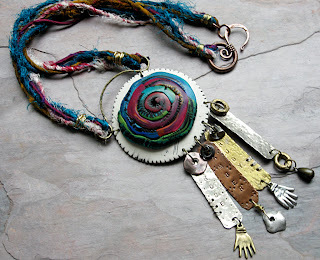 This tale begins with an e-mail from Lorelei Eurto, a jewelry designer I met this spring. 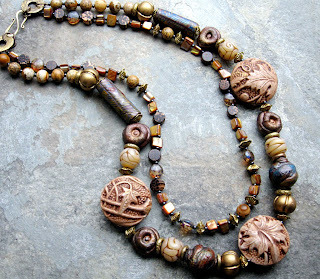 She traded one of her lovely necklaces for some of my beads (that she took and transformed into “The Convertible” a necklace which will debut in The Best of Stringing, due out on September 22). 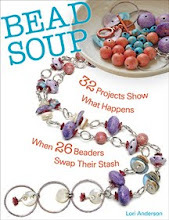 She and Heather Powers had cooked up a bracelet exchange--a la A Charming Exchange, a book by Kelly Snelling and Ruth Rae--that featured artists collaborating on various jewelry pieces. It was tremendously inspiring and looked like a heck of a lotta fun! Now they were inviting ME to play with them! 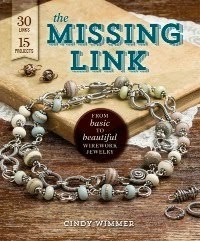 along with Erin Prais-Hintz of Tresori Trovati and Erin Siegel of Every Heart Crafts . Alternately thrilled and nervous-- would I sing out of key in this “band” of artistic sisters or lose the collaborative beat in the flow of my own ideas? Due to blips in my personal schedule, I chose the caboose position on the Bracelet Train, an exalted or a hellish position, depending on your point of view. Most of the design was already in place--would my editions to the final product add or detract? Well, I was up for the challenge-- I might be scared but nobody ever said I was a quitter! 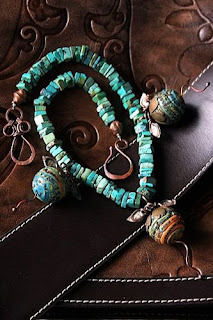 We started by supplying something to get the process started-- a bead, a section of chain, a clasp, some fiber-- the items were as individual as the artists. Then, beginning with Heather, each person added to the bracelet as it was sent on to them. In order for you enjoy everyone's point of view of the process, visit the blogs of the participating artists (see links, above) for their comments on their additions. I'll discuss the final additions and present the completion photos here. 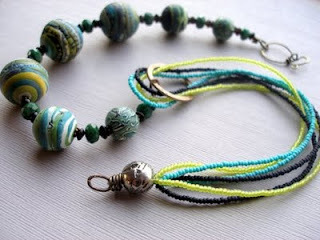 Lorelei's bracelet came with a wonderful color scheme—lemon-lime-- based on the saucy little bottlecap bead that she supplied to start. 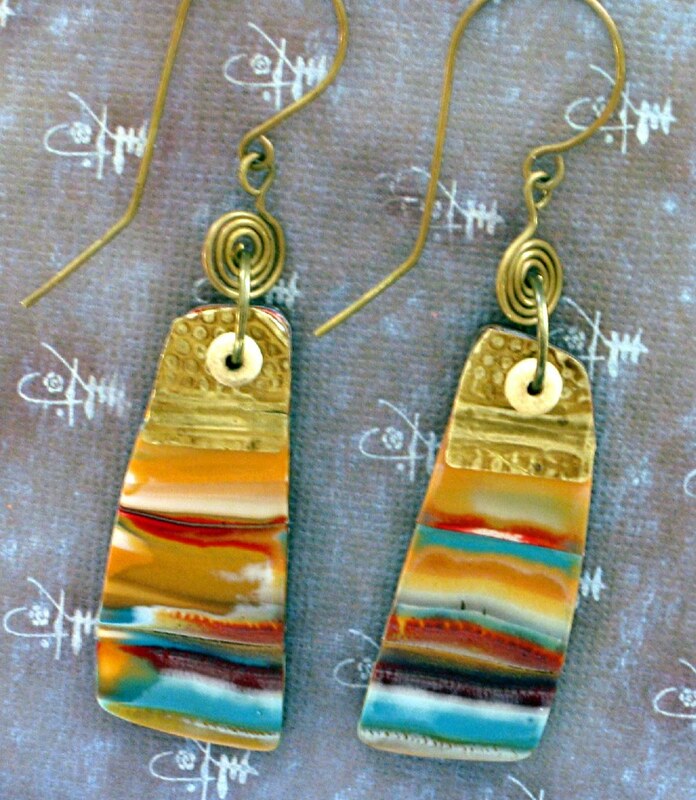 I decided to keep that color going using one of Cindy Gimbrone's slinky chartreuse glassblown links, connected with some antiqued bronze chain. To add a little tension to all the curvature, some bronze cubes joined the party. 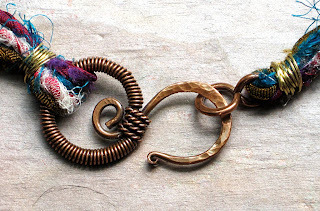 Finally, to partner the large circle link proclaiming “Motivation”, I built a hook from a copper-coated flat forged donut from Jatayu with a polyclay slice in my Apocalypto colorway. 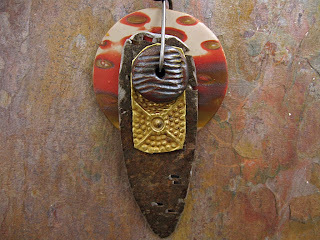 I've fallen in love with 50s-era copper jewelry and this was my homage to the work of Marjorie Baer (see my post "A Good Nose For A Deal", July 28 ). 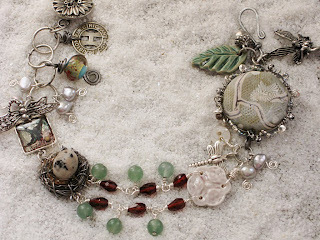 Erin Prais-Hintz supplied an incredibly elegant start to her piece, a wonderfully embellished button clasp with wirewrapped goodies and resin. 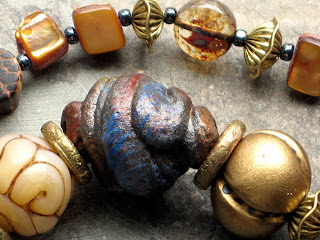 It was my intention to add my “signature” to every bracelet so I made up some mokume gane clay I call “Erin's Mokume” in shades of pear, deep lilac, cordovan and gold leaf and made a couple of roundelles with it as dangles. 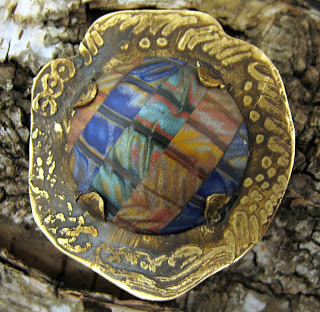 Lorelei had contributed a round brass locket so I put a tiny circlet of Erin's Mokume inside as a surprise! 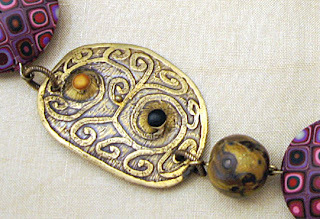 Two color-fumed Czech flower trumpets peek out beneath her clasp and I added one of my signature swirl beads in bronze. I think my additions are uniquely my style yet enhance the whole without overwhelming what had been added previously-- my goal throughout my process. On to the other Miss Erin, Erin Siegel of Every Heart Studio, and the woman I knew the least about. 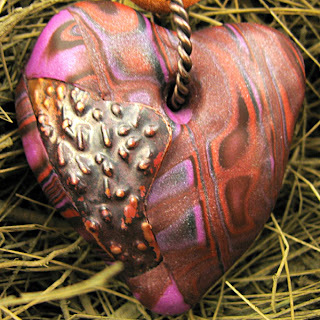 But I did know she used beautiful, vibrant colors in her clay pieces and I was getting a strong color direction from the other additions. I have lately fallen in love with Picasso-finished seed beads. The fine chain and black waxed linen cord seemed to beg for some color to play with so I strung some stone amethyst color no. 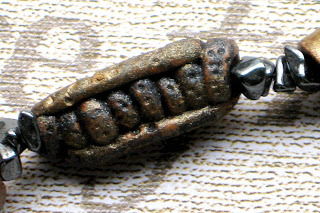 8 Toho beads between the strands. 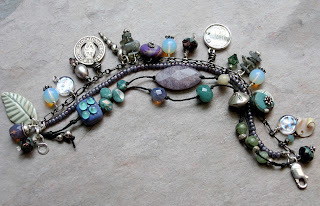 Staying subtle but wanting to add some shine, next came a couple of labradorite chip stacks, dichro-dotted glass beads and a silver-washed pewter spike from Jatayu. I forged a figure-eight clasp end from silver and saluted all the bracelet's colors by adding several purple/tanzanite swirl half-Picasso finish roundelles and an “Erin Mokume” roundelle to play off Heather's. 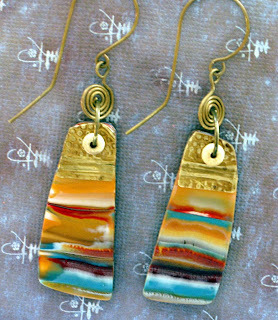 The result--lovely, intuitive colors in a soft, informal stringing style. Heather's bracelet reminded me of an adornment to celebrate Midsummer's Eve in Lothlorien! Shimmery silver tones everywhere, fairies and dragonflies and swallows and splashes of blood-red color paired with jade green baubles. I would have to channel the Lady Galadriel for inspiration on this one! Many elements in interesting variety were already in place-- what could I possibly add to enhance this eclectic yet magical mix? I pondered for days and finally the Muse came to my rescue-- one night the moon was circled by a misty ring of ice crystals, and an idea was born! I looped two fine strands of polished steel in a bezel around Heather's bead and looped on Karen Hill Tribe molten silver drops, tiny carved silver rounds and sparkly no. 11 seed beads to halo her amazing disk. A few soft gray pearls with silver spirals rounded out the tones and I was content. 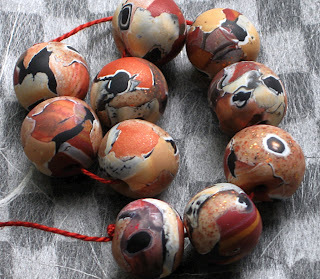 My own bracelet came back home to me as well, my starting element of a simple faux jade bead transformed into a strikingly colorful, woodsy and wonderful symphony of form and texture! Technically and artistically, it was complete. 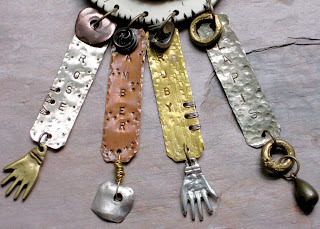 Did you notice that all the pieces had a word included in some clever way-- a hammered disk, a forged ring, a resin charm? These were the brainstorm of Erin of Tresori Trovati, who asked us all at the beginning of the process to supply one word to describe ourselves. Well, my word was “transformation”. I decided to transform my bracelet into a necklace! 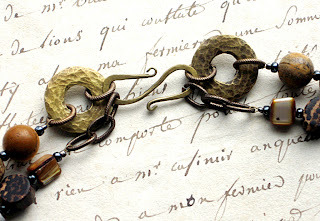 I used several strands of different antiqued brass chains from Vintaj and a bronze ring from Michael's to balance the ornate antique button that Lorelei had crafted into a clever clasp. After repositioning a few elements so they would hang properly in their new orientation, I had an adornment that was not only handsome but something to make me smile every time I wore it, remembering the happy and challenging collaboration we five shared. If you get an invitation to be part of something like this, jump at it! You won't be disappointed. Thank you ladies all! I celebrate your creative spirits and generous gift of your time, thoughtfulness and skill! It's always been a real chore here in rural Vermont to get together with other artists for the kind of idea-generating, think-outside-the-box, give-and-take of artistic energy that's the real excitement about taking a class. 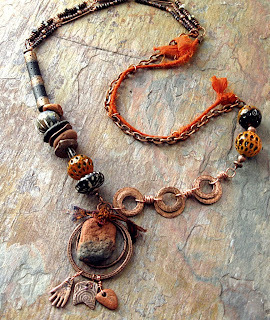 That's one of the reasons I am so looking forward to the Bronze and Copper Clay class that I'm taking at Celie Fago's studio next month. I have fond memories of Friday afternoons after class in my ceramics program at the School for American Craftsmen. The wood shop folks, at the studio next to us, would wander in and frequently the glassblowers and textile people would stop by as well. Lively conversation was usually about the work and design ideas were thick in the air. We potters often visited the studios of other craft disciplines and found inspiration in the creations of the other student craftsmen. It was heaven! Now we have a powerful tool for forming working relationships with other artists-- the Web. We swap photos, ideas, sketches, and inspiration easily. We share our work, critique and encourage each other and benefit so much more than if we stayed isolated in our own little worlds. 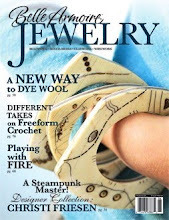 Lately, I was priviledged to collaborate in two different projects with other jewelry artists. The enrichment that this has created in my personal artistic life is immeasureable. I'm writing about them in separate posts--one today and the second later this week. 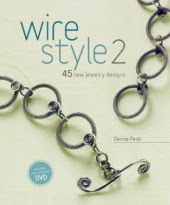 I first met Cindy Wimmer virtually through a tutorial that was published in Step by Step Wire last summer. I'd been thinking about a necklace all composed of various styles of silver links and loved the ones in her creation, called “Heart Strings”. I saved the article in my design notebook for future inspiration. 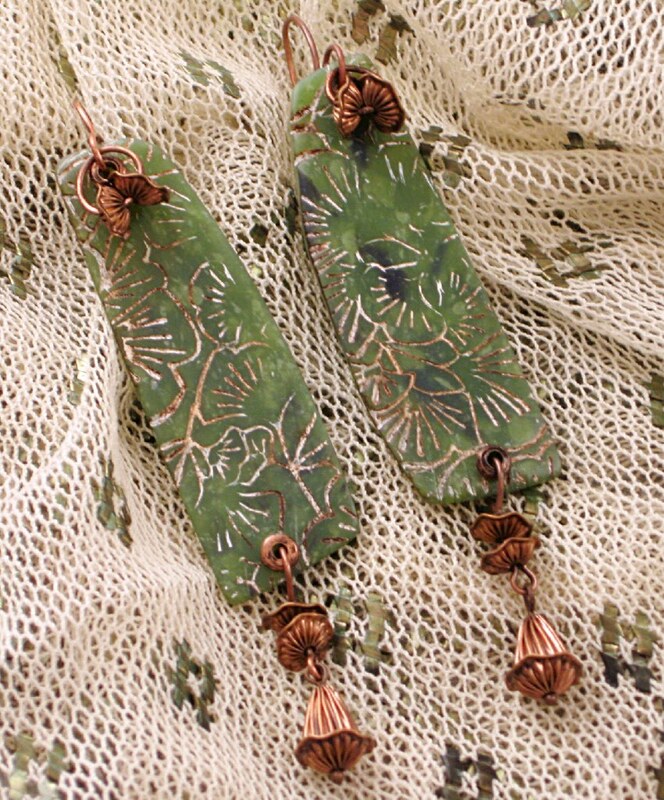 Next thing I knew, she had e-mailed me that I was the winner in her blog giveaway, and was shipping me a lovely little mixed metal pendant called “Joy”. This gift came at a time when I was struggling with the bureaucracy of a mortgage re-finance and I can't tell you how many times looking down at that word—JOY-- around my neck saved my spiritual equilibrium! 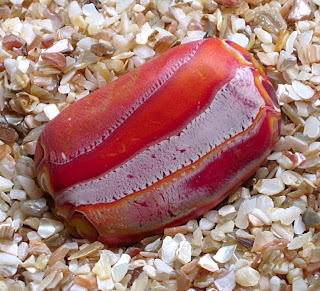 We started up a correspondence and shared ideas and personal stories and when the opportunity came to submit a design to the Objects & Elements blog of Susan Lenart Kazmer for a challenge called “Summer Colors”, I suggested we collaborate on the piece. 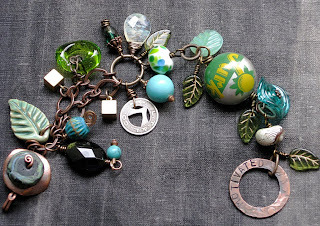 I loved the idea of dangling charms in mixed metals and we agreed that stamping them with the names of colors would add an extra interest. 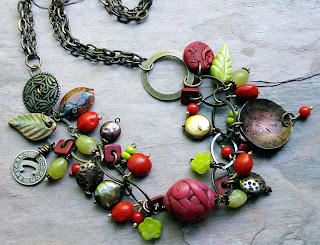 Cindy's clasps are amazingly well-crafted and inventive so she agreed to supply that element as well. The rules of the challenge require using items from the O&E shop. 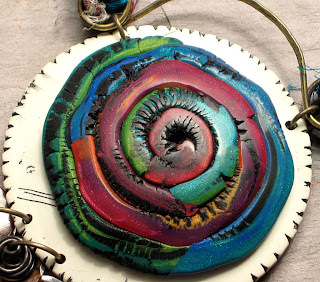 The colorful recycled sari silk yarn caught my eye immediately and served as the inspiration for the colors in the polymer clay pendant disk. I have to say I've been very influenced by Robert Dancik's book “Amulets and Talismans” that I purchased last month so I did a faux ivory disk to back the main pendant and set the colors off. I added a handforged bail and wirewrapped the silk around it and the clasps and named it “Midnight in Mumbai”. It was a dream working with Cindy-- she is a superb craftsman and we seemed to swap ideas almost by ESP! Her metalwork was even better than my expectations. We are planning future adventures together, maybe a magazine submission? Anything is possible when like artistic minds meet and the result is synergistic. Oh, the voting is open until August 26, 10 pm EST this Wednesday. There are a wealth of beautiful interpretations to choose from and, if you feel so inclined, we'd love your support! *Synergy--from the Greek syn-ergos, meaning working together, is the term used to describe a situation where different entities cooperate advantageously for a final outcome--meaning teamwork will produce an overall better result than if each person was working toward the same goal individually.